This was one of my favorites...You did a beautiful job here. That brick pattern just makes the shot.... at first I thought it was photoshopped in, but now I see that it is not... 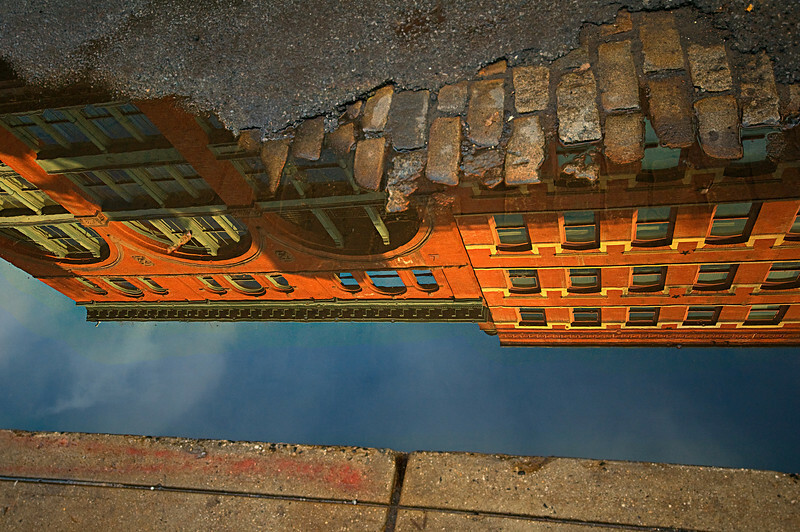 The way the sky and the bend on the windows and the direction they are bending gives this puddle so much depth.....great work and very creative.. ..
Great reflection. Very nice vision. Excellent capture of a striking reflection of building and sky framed by the bricks and pavement. Lovely colors. Thanks for the kind comments. It's not a composite--just a fleeting moment after an April shower on the streets of NYC. This gets better with age. Superb shot. Nice capture. I predict this to be a finalist. Creative idea--saturated in both subject and color. Excellent! I love this. What a great concept and unique vision. I love that it looks like a composite image, but (I'm assuming) is not. Great color treatment, without being overdone.